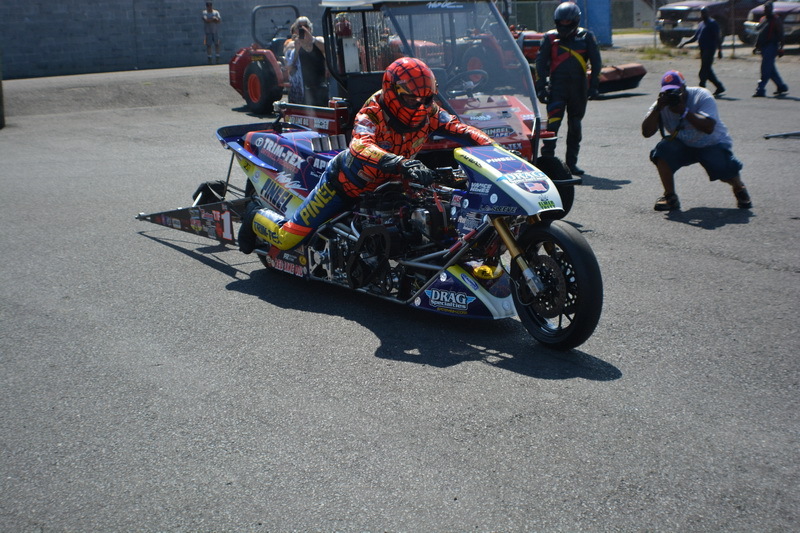 When MIROCK motorcycle drag racing booked Top Fuel superstars Larry “Spiderman” McBride and Dave Vantine for a three-event match race series in 2014, the idea was to put on the best show possible for the fans. 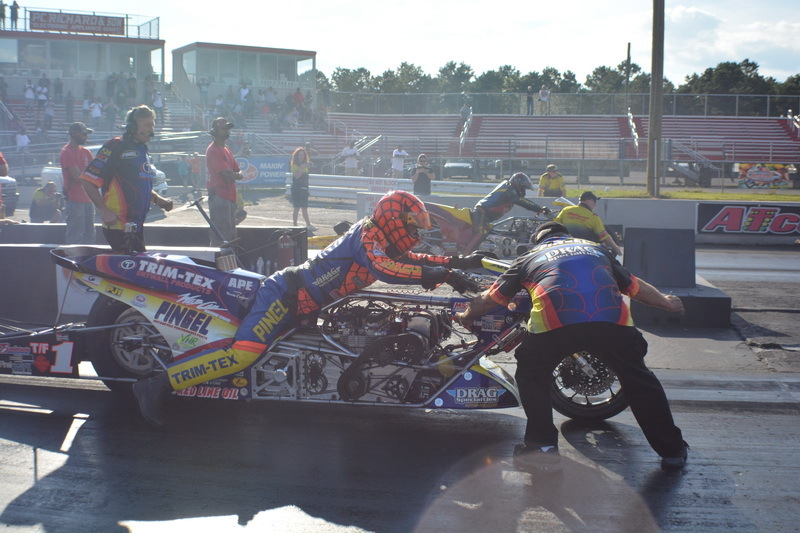 Dragbike racing’s only side-by-side five-second found reason for optimism upon arrival and inspection of Atco’s new racing surface. The pristine launch pad was trumped by Saturday’s disadvantageous racing conditions, with temperatures in the 90s, high humidity and over 130 grains of water in the air. McBride was dissatisfied following his solo test pass. “It was really hot, the track was tough and we just missed the tune-up,” McBride said. Of course the veteran has reached a point in his career where even a far from flawless pass is still a crowd-pleaser. 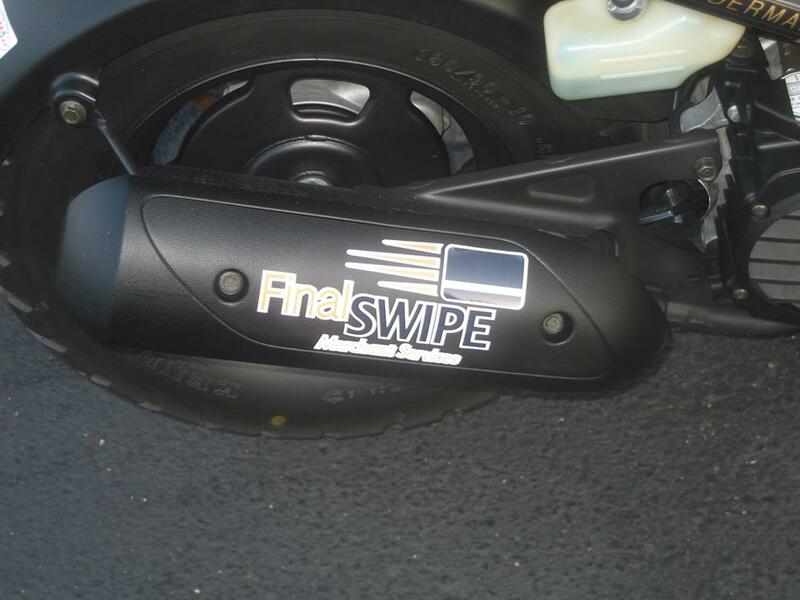 McBride’s time slip read 5.96 at 199 mph. In their first match race of the weekend the Spiderman tussled to gain traction and slowed to a 6.49, as his protégé reached the finish line first with a 6.17. “We just could not seem to get the tire hooked up. It dropped a few holes and I shut it off early,” McBride said. Larry “Spiderman” McBride’s Saturday 8PM match race was rained out. The 12-time champion passed the time visiting with friends and fans in the Atco Raceway pit area. A storm moved in on Saturday night, forcing the cancellation of the match race scheduled for 8 PM. “It’s a shame because it cooled off and the track would have been a lot tighter,” McBride said. Overnight the weather drastically changed for the better. The humidity plunged and temperatures cooled off to the 70s. Favorable conditions were evident in the first run of the day, as McBride and Vantine nearly made side-by-side history again, with Spiderman clocking a 5.97 to Vantine’s 6.04. McBride shut off 5.8 seconds into the run. 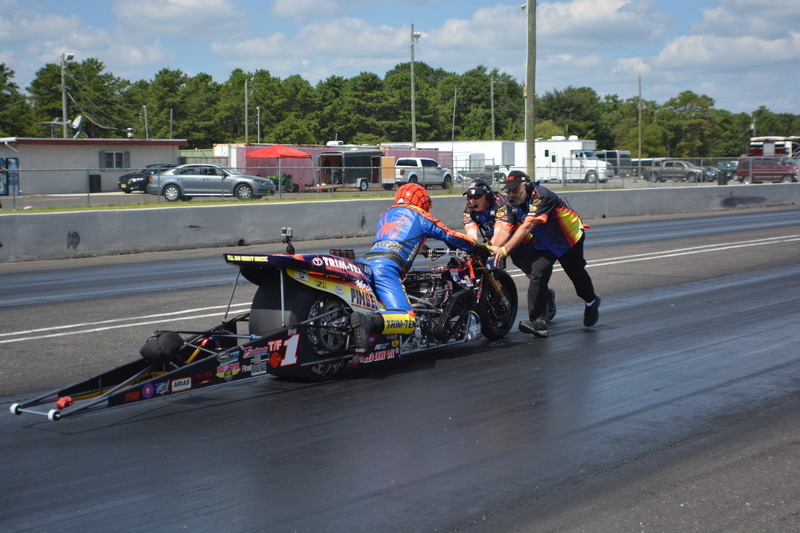 In the final run of the weekend McBride smoked the tire and slowed to a 6.88 at 199 mph as Vantine gained the win light and the overall victory for the event, taking two out of three from his mentor, with an impressive 6.04 at 233 mph. Next up, the team will return to the site of their historic side-by-side five, Maryland International Raceway, Oct. 3-5, for the Fast by Gast Fall Nationals. “There is not one sponsor that is not important.” McBride thanked his associate sponsors and added, “Everybody is equally important. We couldn’t do it without each one of these fine companies.” K&N Air Filters, Web-Cam, Vance & Hines Motorsports, PR Factory Store, Ferrea Valves, Kibblewhite, Precision Machine, World Wide Bearings, Vanson Leathers, Millennium Technologies, Belt Drives Ltd, Simpson Race Products, Nitrous Express, APE, EK Chain, Arias Pistons, MSD, Protect ALL, Cometic Gaskets, B&J Transmission, Carolina Cycle, L.A. Sleeve, PJ1, Mickey Thompson Tires, Valco, Goodridge, Carlisle Belts and Gates Belts. 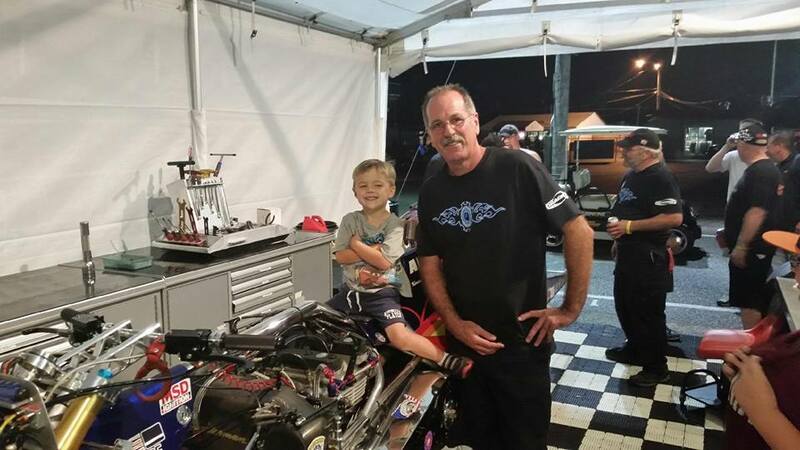 Second year Top Fuel racer Dave Vantine continues to look more like a seasoned nitro veteran. Vantine defeated his mentor by winning two out of three match races. Larry McBride prepares for a trip down Atco Raceway- a track he has raced at for over 30 years. 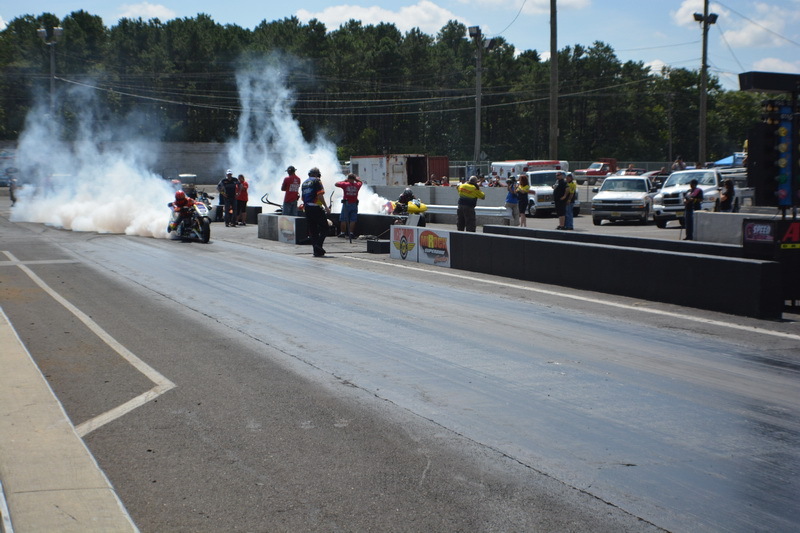 Larry McBride and Dave Vantine bring Atco fans to their feet with side-by-side burnouts. 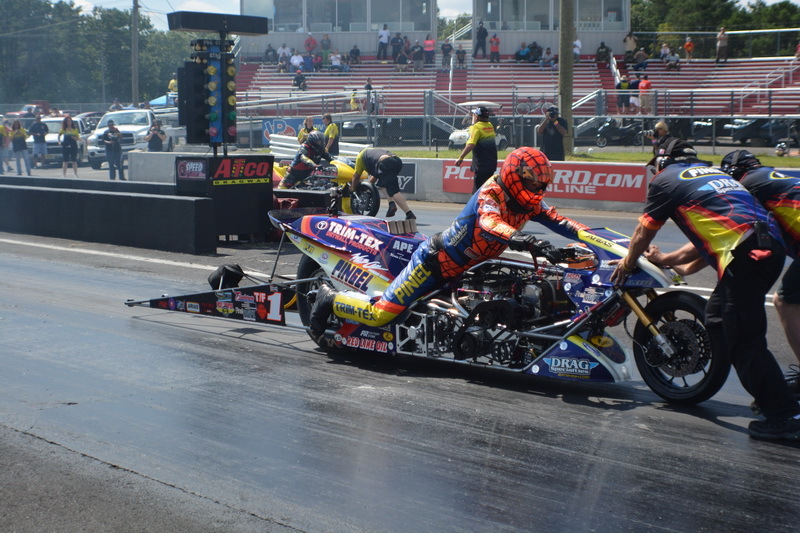 There isn’t a reverse gear on McBride’s 1200-horsepower plus Top Fuel motorcycle. The crew gets a workout pushing Larry and the 1,030-pound marvel back to the line. 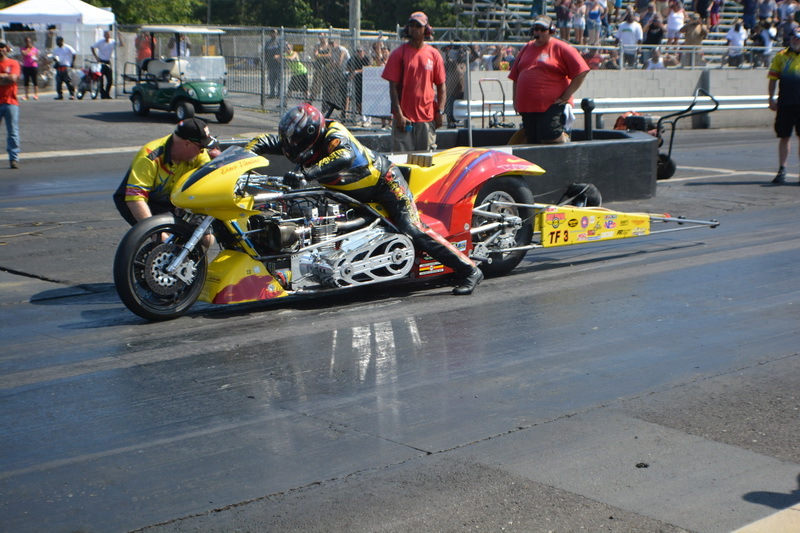 Larry McBride and Dave Vantine nearly turned in their second side-by-side five second pass. The duo will get another chance to make history in October at MIR. As someone who started racing DRAGBIKES at ATCO in 1968, I have seen just about every superstar make a pass down that famous track. As much as I am impressed to see a no-bar bike run 6.91 @ 219, there is nothing like the sound, the thunder and the smell of NITRO ! Especially when you can get two bikes to make a side by side full pass. Thanks to Larry & Dave and crews for putting on a good show. It was good to see more fans in the stands this year and standing and cheering. Been awhile since we saw that and maybe next year MIROCK can expand the show. Thanks for a great show to all that raced.